An ancient city in the Prussian governmental district of Coblenz. From very early times a Jewish community was sheltered within its walls. About 1255-60 a certain Godelif, his wife Bela, and their son Moses, all of Andernach, are mentioned in the "Judenschreinsbuch" (Jewish archives) of Cologne. In 1286 Andernach was almost entirely destroyed, its houses and synagogues were demolished, and the Jews, who had taken refuge in the castle of the archbishop of Cologne, were expelled from the town. The archbishop, Siegfried von Westerburg, took pity on them, and for their protection issued (August 3, 1287) an award against the town and its burghers. As early as 1253 a Jew from Andernach acquired possession of a piece of ground in Cologne. From the following buildings and districts to which Jewish names are attached an idea can be gained of the size of the former community of Andernach: the synagogue, the Jewish cemetery on the Benn, the "Judengasse" (Jews' quarter) at the castlegate, the "Judenthurm" (Jews' tower) between the sheep-gate and the church gate, and the "Judenberg." There was a "Judenbüchel." The wealth of the community is indicated by the large number of commercial papers that have been preserved. Entrance to the Jewish Bath at Andernach. 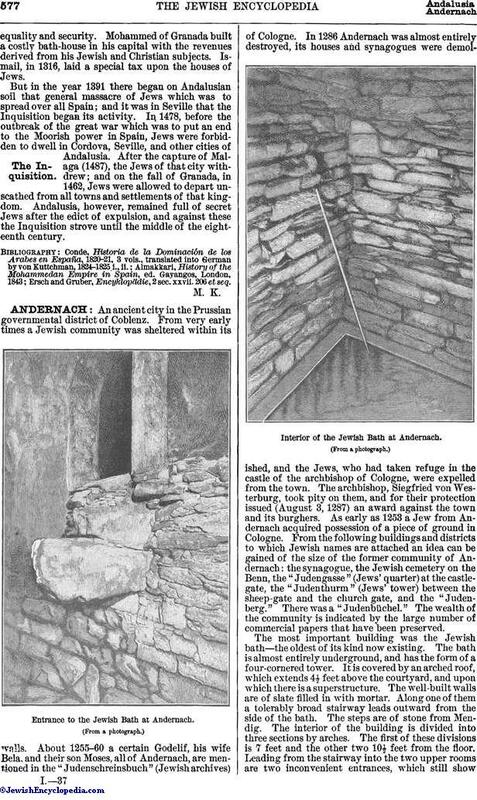 Interior of the Jewish Bath at Andernach. The most important building was the Jewish bath—the oldest of its kind now existing. The bath is almost entirely underground, and has the form of a four-cornered tower. It is covered by an arched roof, which extends 4½ feet above the courtyard, and upon which there is a superstructure. The well-built walls are of slate filled in with mortar. Along one of them a tolerably broad stairway leads outward from the side of the bath. The steps are of stone from Mendig. The interior of the building is divided into three sections by arches. The first of these divisions is 7 feet and the other two 10½ feet from the floor. 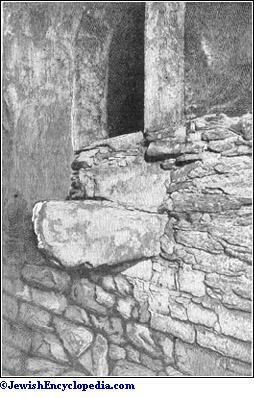 Leading from the stairway into the two upper rooms are two inconvenient entrances, which still showwhere doors formerly stood. The lowest arched room originally had fairly wide apertures for the admission of light. 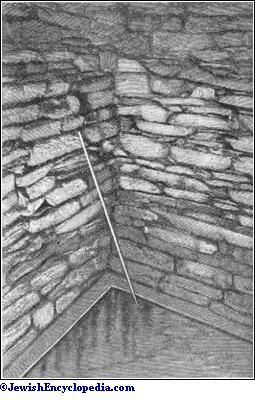 The walls are built on oaken piles; and the depth of the hall is 36 feet. The descent to the basin is by wide steps; and the depth of the water, which fluctuates with the rising or falling of the Rhine, is never less than 2 feet. In 1337 and 1349 the Jews of Andernach suffered from persecutions; but the date of their expulsion is not certain. In 1573 they made a successful attempt at resettling in the town; but their commercial privileges were restricted. About the close of the sixteenth century, in consequence of fighting in the surrounding villages, a great many Jews sought safety in the city, but were driven out in 1597. Again, at the time of the Thirty Years' war (1618-48), the Jews took refuge in Andernach. 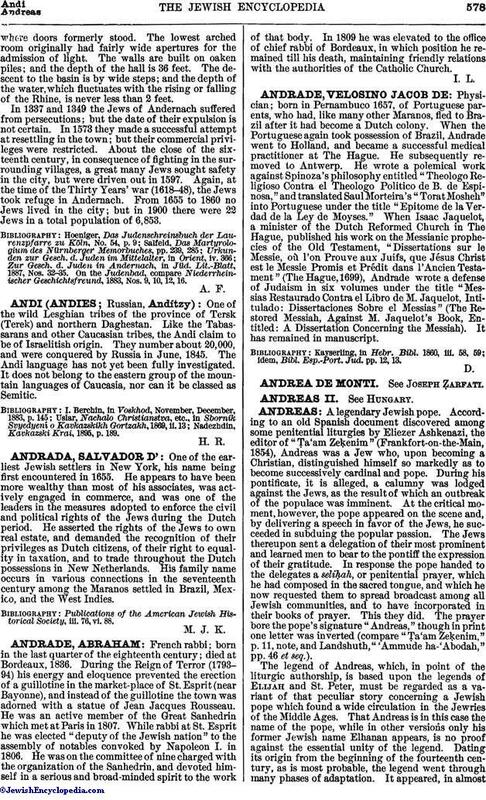 From 1655 to 1860 no Jews lived in the city; but in 1900 there were 22 Jews in a total population of 6,853. Zur Gesch. d. Juden in Andernach, in Jüd. Lit.-Blatt, 1887, Nos. 32-35. On the Judenbad, compare Niederrheinischer Geschichtsfreund, 1883, Nos. 9, 10, 12, 16.